When you co-own a site that focuses in on book-to-movie adaptations, you can’t be super picky. I always joke that I “like to like things” because on the whole, adaptations make me happy so long as they resemble the book they’re based on. From genuinely good to “so bad it’s good”, I generally think these things are meant to be enjoyed. The Season 4 finale of Outlander was the most frustrating episode of the show to date. In what should have been the most powerful, emotionally-driven episode of the season, things ended with a whimper instead of a bang. What started off strong with the failed rescue attempt and Young Ian taking Roger’s place among the Mohawk quickly fizzled as in the last thirty minutes or so, the writers seem to realize that they didn’t actually give themselves enough time to finish out the story properly. In its fourth season evolution, Outlander is about more than Jamie and Claire– It’s about the Fraser family. With the exception of Ian’s big moment, the season finale seemed to forget that we need an emotional connection to these characters. We need to be invested in their development. The best it does is manage to get Jamie, Claire, Brianna, Roger, and baby Jem in the same vicinity. The final minutes of the season are a cavalcade of important family moments squandered: Claire and Jamie are not there for Brianna during her baby’s birth. Brianna talks of forgiveness to Murtagh, but is never seen actually reconciling with Jamie. We never see Jamie and Claire enjoying being grandparents together. Roger never meets the baby. Roger and Jamie never take a moment to come to terms with each other. We’re not told the baby’s name (even though book readers know it). The stilted, awkward days of Brianna and Roger not being so sure about their relationship before coming back to each other are swept aside. The Gathering and the famous “Tell them the MacKenzies are here” line that I love and that was SET UP IN A EARLIER EPISODE were not even approached. Almost every major emotional note regarding the Fraser family unit was missed. Part of this is an overall Season 4 pacing issue. There are only 13 episodes in a season. We spend an entire episode with Willie and an entire episode with Laoghaire. There are drawn out dramatic moments making peace with the Native Americans of the region. There are at least two plotlines thrown in just to remind us that Claire is a surgeon. The return of Murtagh (which I loved overall) brought along a sizable regulators subplot that isn’t present in the books yet. We spend a huge chunk of the penultimate episode with a priest who dies 40 minutes later. These things would all be fine if the rest of the plot moved with it, but it doesn’t. Brianna and Roger initially falling in love is more implied than seen. Jamie and Claire are rarely seen taking issues on together. Fergus and Marsali make the most of the time they have on screen, but it’s very little time. What it largely boils down to, of course, is the finale trying to squish what should have been two episodes of material into a single hour of television. It was a wholly unsatisfying ending and one that gives the characters very little credit. After an entire season of reminding us how deeply flawed these characters can be, didn’t we deserve a few moments to see the good in all of them as they came together? The finale really throws things off kilter, but the show can redeem itself in some aspects in Season 5. The Fiery Cross aka Book 5 is not exactly Gabaldon’s strongest contribution to the Outlander series and frankly, I wouldn’t mind that plot was cut down to show us more of the struggles and triumphs of a family gone through hell and back that’s still working itself out. We’ll never get a redo on Jem’s birth scene, but if the next season picks up right where the fourth left off, we can still get the gut-punch of Roger kneeling before the baby and declaring him his son, no matter what. Jamie and Brianna can have that discussion that so needed to have, even if belated. Roger and Bree can still experience relationship insecurities in the wake of their new situation and eventually come out on the other side of it. After a long cooling-off period between seasons, will it still pack the same emotional resonance? No, probably not. But it’s better than simply implying that everything in the Fraser family is A-okay and dancing on to the next forced moment of ~*~political intrigue~*~. Yes, there needs to be a solid story threaded throughout any show if it means to be successful, but let’s not forget: No one cares about the story if they don’t care about the characters involved first. This is one of the best analyses I’ve read addressing the issues with the finale and generally with Outlander Season 4, so just wanted to say thank you. If you love the show and don’t see the things I mentioned as missteps, you’re certainly welcome to that opinion. WONDERFUL review and you seem to hit every nail on the head. The best parts were left out…and the finale fell so flat. Even Bree’s dramatic run to Roger felt forced and anti-climatic. Excellent review. I was thoroughly disappointed in S4, and failing to.have J&C there for Jem’s birth was unforgivable. I was a little disappointed in the final episode. I was hoping Jamie and Brianna would kiss and make up. We know she forgave him only because she told Mertaugh. I wanted J&C there for the birth and I wanted to see Jamie holding his grandson not Jacosta. And I am not feeling the chemistry between Brianna and Roger. If you must return certain actors to the series, put them in as one of the new Characters – otherwise spoils the story line. I am almost to the point that I will stop watching it and just reread the books! I just wish Diana would publish the next book. We have waited what seems like eons. She keeps saying later this year! I hope so, but I’ll take early 2020 too. But if it comes prior to the end of droughtlander I’ll be ecstatic. excellent rendition of the season and last episode….if anything, the finale could have been and hour and half to add your suggestions above. They could have done it all correctly..as in the 1st season..with 16 episodes! !..I hate DROUGHTLANDER!! I think the fact that Brianna accepted the bread from Jamie at the table then turned to meet her mothers eyes was intended to imply forgiveness towards her father. The beauty of this was that it was so subtle but it was there. A piece of bread is a poor substitute for Jamie holding Brianna as she gives birth! I waited the whole season to finally see the reconciliation and bonding of Jamie and Bree and I got nothing. Disappointing season and finale. I know the writers mean well and want to do their best so I hope they listen to the frustrations of their fans. You hit the feelings of many right on the head! Please, dear writers, don’t cut iconic moments if at all possible. As someone already says: spot on. I also was waiting for some affection and conection between Jamie and Claire….and how will Jocastas storyline be when Murtagh is in the picture?? I wonder if the writers really has read the books? To be exact but I do hope for the intent of the writing to be used. I love the Mohawk information, disliked Leghair scene, loved the addition of Murtagh, am not fascinated by Bree Roger other than as a side and family issue. Taking the Jamie Claire center away has made me sad. I couldhave dealt with it if There had been a “Jamie and Claire present at the birth of their grandchild” scene. I like the Bree and Roger story but they do not have the magic, in the book or on TV, that JC have. I can only hope they make up for it in S5. The complaints should at least make the writers think about what they missed. Perhaps taking a 800-900 page book deserves o be broken down into 26 episodes instead of 13. Sony/Starz makes a fortune off the outlander fan base, and they are doing us an injustice taking the liberties in changing the pivotal aspects of our beloved story. It is truly disappointing. Matt Roberts has said both increasing the number of episodes and increasing the time for each ep was too cost prohibitve. Though it would’ve been nice if the finale was longer. He also said Droughtlander would be longer. I don’t know about you, but I’d rather have a normal Droughtlander than an extended one! You expressed exactly how I felt about the finale! I do hope they pick up season 5 where they left off season 4. Part of the problem I think is that they had different writers every 2 episodes which in my opinion caused the disparity. They needed a set team like they did in the past. Each one wa alike a mini story without continuity to the past threads. I agree on this…having different writers was a mistake! I was absolutely devastated that the true birth scene was changed to a pathetic rushed scene that did little for anyone’s heart. The birth scene from the book would have been a grand finale and I was so looking forward to it. It is one of my favorite scenes from the entire book series. You cannot imagine how angry I was when I saw the last episode. I had such high hopes for seeing that scene and it was dashed to hell. I even contemplated starting a petition to demand a “do-over from the writers. It was unforgivable what they did. How could they have been so stupid and dense to not realize how important that scene was! We need new writers who know what they are doing! I felt the same…Season 1 was the best and most similar to Diana’s vision, in my opinion. I thought season 2 had some good moments as did season 3…However, other than the Willie and Jamie episode and the Jamie getting to know Brianna episode, the show felt very plot and not character driven. 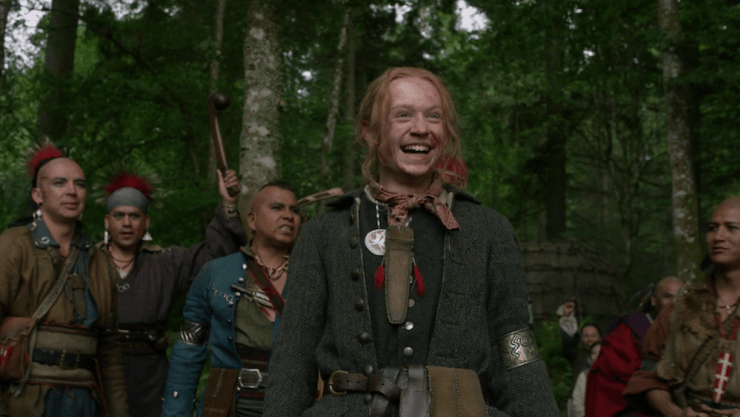 Little connection was felt among Jamie and Claire, Jamie Claire and their new grandchild, Fergus and Marsali were great but given only a small amount of screen time, with for me, young Ian being a bright spot in season 4. If the showrunners wait too long to bring back season 5 and don’t go back to the heart of what makes this series great, they will start to lose their viewer’s interest! While I am still invested, this season left me disappointed and I am not experiencing any signs of Droughtlander! That is mainly because Sam Heughan and Caitriona Balfe were left out of many episodes and had very little interaction together! Please fix it next season, and give Sam and Cait better hair! Thank you in advance! Not dislike but I am sure it left us all wanting a satisfactory ending.,. This just left us dangling. I have read the whole Outlander series of books at least five times but season four was a disappointment. Hope season five is better. Short and sweet from me darling…….BRAVO. You spoke my mind. I agree this is not Bree what we were expecting. I am still waiting to see Frazer’s Ridge where most of this episode was taking place at. At this time a settlement was taking place. Not just one cabin. I actually think the actress portraying Bree made her more likeable than book Bree. I found book Bree rather self centered and unappealing and generally skimmed through many of the sections involving her, at least in books 4 and 5. Pretty much still the spoiled rather self centered person that Frank raised her to be. Have discussed with a number of book readers who also found themselves skimming through the Bree sections. To me, her two shining moments in DOA was meeting her father and the forgiveness and bond created by his presence at Jem’s birth. They did a stellar job of the first and I am completely mystified why the second was left out. As far as Roger and Bree’s relationship, it was mostly awkward, conflictive, and tentative throughout DOA in the book. That’s pretty much what I saw on the screen. Overall thought it was a well done season . Have to agree. Overall, the writers have managed to be so faithful to the book, giving us the essence and so often nearly word for word, that this final episode was disappointing. They could have done so much better. 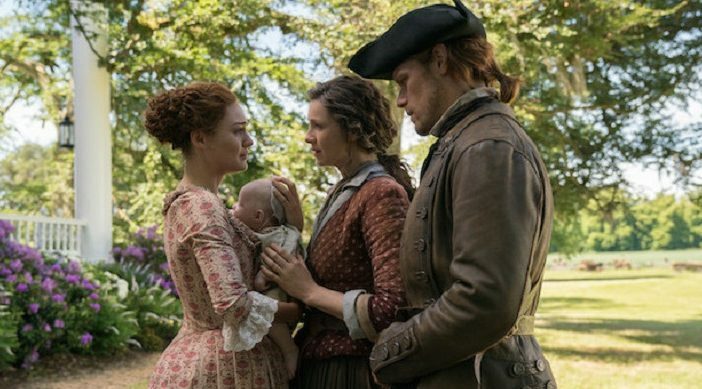 I think, yes, if they had had one more episode–or even a half hour extension, they might have been able to include Jamie and Claire in the birth–very important for Bree/Jamie reconciliation as he is very much involved in the labor–and the very dramatic claiming by Roger of the baby. I was very happy to have Murtagh return and, eventually, get it on with Jocasta, but the birth and claiming of baby Jem was very important. Also, these last two episodes were very sad/stressful and we all could have used a little “happy ending”–I had been looking forward to the Gathering scene as well. Thank you for saying everything that I feel about Season 4. I am an avid fan of the books and was so disappointed with the TV adaption of Drums of Autumn. Lets hope for better for season 5. I have read mountains of recaps/reviews and social media commentary. THIS is everything. Thank you!!! Absolutely agree with you. Was very disappointed that they changed the birth scene. That was a pivotal point in the book and in the Jamie/Bree relationship. It would have been good to see Roger hold his son, too. Much better than watching the British riding their horses up to River Run. Hopefully, they’ll work in some of these missing scenes next season. I agree 100%. Very disappointed the birth scene was changed. They didn’t show the friction between Roger and Jamie. And more importantly, a shame they didn’t include the final Gathering! I totally agree I’ve become a little less enamoured with each season. I absolutely love the books, but the series lost me half way through season 3.. I want to be able to enjoy the series and I am so unhappy that I just can’t get there…. everything I have read about season 4 leaves me feeling like I’ve lost a dear friend…. Murtagh and Jocasta in bed was a big WTF. As an avid reader he will always be meant to be lost in Culloden. Thank you for this. I agree on your analysis. I started watching the series first then the books. I do love the show and am a big fan but once I got into the books, well…I’m a big fan of the books. I am 1/2 way through Fiery Cross and it is slow going and it will be interesting to see how they portray this. I really wish they would have done the last season differently. In the books Jamie was there during Brianna’s birth and they were connected in the books. I am not a fan of how they portray their relationship on screen. I can’t fathom why the writers/producers decided to waste a large part of one whole episode (scene after scene) showing Bree hobbling through the countryside after going through the stones and the rest of that episode at Lheery’s house!!! WTH?? That was almost an entire episode of stuff they totally made up that had nothing to do with the actual story in the books. Could have used wasted time to tell the actual story and not been so crunched at the finale. A lot of useless stuff inserted for no reason. Is Ron D Moore no longer there? We agree on gender, number and grade with your observations! Really, the 4 season was the weakest of them all. The last chapter so difficult to see, complicated, loaded, kind of without logic! The participants did only what was expected, without taking place in the same way as in previous seasons, where the last chapters have always been great! Now, hope that EVERYONE puts the train back on track! Outlander is different things to different people. Most in my circle (and I’ve recruited at least a dozen people) have never read any of the books. They love what has been presented to them via the TV show. They don’t know any different about the storyline. Even though I have read the whole series, I don’t have a problem with changes except for some of the needless and time consuming scenes i.e Leery, Brianna wandering the hillside. I loved the finale actually. If you think they can get all your wishlist points into a 1 hr show you have got to be kidding. They did the best they could. Could they do better? I’m sure they could if they had more time like a 1.5-2 hr finale. A lot of the commentary out there seems to be books vs TV show and I honestly don’t think any of it is fair to those who only watch the show only. Millions of people love Outlander for what it is. A wonderful adaptation, great acting, beautiful locations and all the rest. Very interesting opinion piece. While I agree with you in large measure with regard to the flaws in the finale, I have a bit different take on what needs to be done. I agree that the story has expanded to include the next generation including Fergus and his family, Brianna and her family, and including William as well as Young Ian. But at the heart of all the books is Jamie and Claire. It was unforgivable of the writers to omit the birth scene or any attention to forgiveness between Jamie and Brianna. The episode with William and Lord John’s visit was one of my top three episodes in S4 because it focused on Jamie and his son. I resented every single moment of Frank in this season. I personally don’t Give a fig about Frank and adding screen time for Tobias Menzies simply because they like him was an inustice to every critical missing scene. To be honest I am sick of Matthew and Toni smuggly sitting there congratulating each other for poor decisions made. I long for more Jamie and Claire focus. For me, Roger and Brianna’s story will never have the appeal of Jamie and Claire because we never had the opportunity to watch their attraction grow into love. The chemistry between the two actors, both lovely and talented, is justnot anywhere close to Sam and Cait. The first thing I want to see in Season 5 is a heart to heart between Brianna and Jamie and an apology from Brianna for that slap. Her emotion ran away with her brain. She has forgiven Lizzie whose mistake startedit all. I don’t want an implied apology. I want to see it. Couldn’t agree more about your observation regarding Toni and Matthew. Their justifications, especially Toni’s, over all the seasons just makes me blow a gasket. Couldn’t agree more with this analysis. Basically they ended 2/3 of the way through the book. So much richness in that part they didn’t cover – where when you got to the end of the book you felt a real family coming together with all the Fraser (Jamie & Fergus) and MacKenzie families. I too love the “The MacKenzies are here” and missed that. Some other things that could be shortened – the never-ending walk of Roger behind the Indians and the Jamie/Claire/Ian trio tracking him. Then spend at least half of that episode on the freeing of Roger and Ian joining the tribe then you could pack more into the last episode. Also, the business of ending with the “I’ve got to hunt down Murtaugh” conundrum really could have waited until next year, letting them end on a bit more of an upbeat note.